Goodreads: Be careful what you wish for. A small town librarian lives a quiet life without much excitement. One day, she mutters an idle wish and, while standing in her house, is struck by lightning. But instead of ending her life, this cataclysmic event sparks it into a new beginning. She goes in search of Lazarus Jones, a fellow survivor who was struck dead, then simply got up and walked away. Perhaps this stranger who has seen death face to face can teach her to live without fear. When she finds him, he is her opposite, a burning man whose breath can boil water and whose touch scorches. 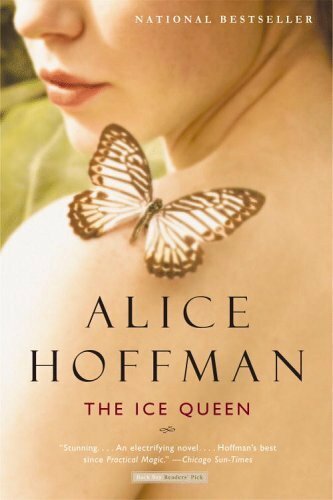 As an obsessive love affair begins between them, both are forced to hide their most dangerous secrets - what turned one to ice and the other to fire. Kritters Thoughts: A book that flowed like a stream consciousness - which unfortunately I wasn't a fan of. The story overall was intriguing, but because of the writing style, it wasn't my favorite. The use of strong adverbs made me fall in love with her descriptions of the "effects" of lightning strike survivors. I adored the relationship between the brother and sister and how the early death of their mother affected the both of them in two totally different ways. But through these likes, I still had a hard time reading and enjoying this one. I would only recommend this book to those who love things that are artsy. Imagery and visualization would be key when reading this book.